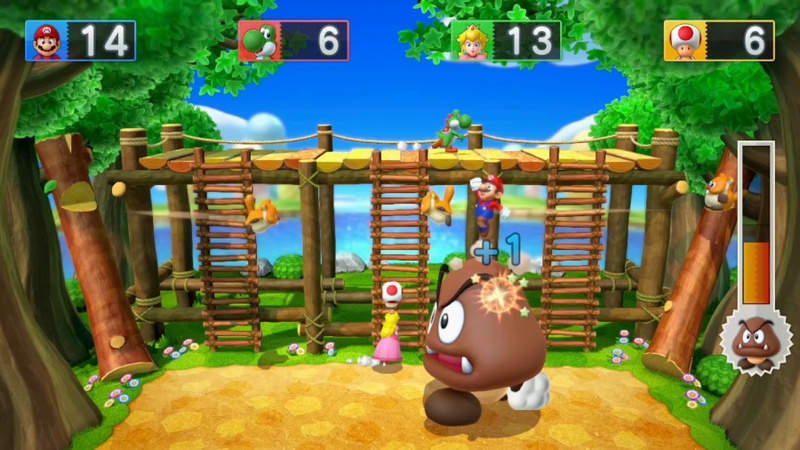 Mario Party 10, as the name makes very clear, is just the latest in one of Nintendo's most substantial franchises. Especially frequent on the GameCube, it's evidently achieved a good degree of success and remains a mainstay on Nintendo hardware, with the home console entries being graced as the main numbered titles. As we highlighted in our Mario Party 10 review, it's certainly a fun party-game experience, even if we had the lingering sense that the Wii U's capabilities could have been utilised a little more. That said, it is a relatively rare case of a title that utilises the GamePad in some unique ways that couldn't be replicated on other hardware, while the usage of amiibo may be simple but is undeniably charming - if our time with some young players in the Nintendo Life family are anything to go by - to children. For easy-to-understand minigame fun that players of all ages can enjoy in various ways, it's another entry in the franchise that delivers on its goals. Keen to get some perspective on the Wii U arrival from those that have brought the series into the HD era, we had the opportunity to pose some questions to Shuichiro Nishiya, Game Director from Nd Cube Co.,Ltd., and Jumpei Horita, Producer from Nintendo Co., Ltd. They share a little about the design choices in this entry, and also try to put an old-fashioned Mario Party grievance to rest. First of all, can you summarise the core focus - from your perspective - of Mario Party 10 in comparison to its predecessors, in terms of the importance of the GamePad, amiibo and Wii U features? Nishiya-san: When we decided we'd create Mario Party for Wii U, the first thing that came to my mind was to give players the possibility to play as Bowser and compete against Mario using the Wii U GamePad. We had considered this idea in the past as well, but we were reluctant to have Mario and Bowser play board or minigames using the same condition. In this installment though I'm really happy that we were able to use the GamePad to provide the players with the opportunity to enjoy playing as Bowser for the first time in the series. Horita-san: The section Mr. Nishiya just mentioned, which makes use of the GamePad like this, is called Bowser Party. It's this section and the amiibo support that are the key features in this installment. The novelty of seeing a Mario-themed map or Mario piece appear on screen after touching your amiibo figure to the Wii U GamePad, the fun of collecting power-ups with your amiibo, and being able to use them to turn the tables in your favour, are just a few examples of what you'll find in this new Mario Party. 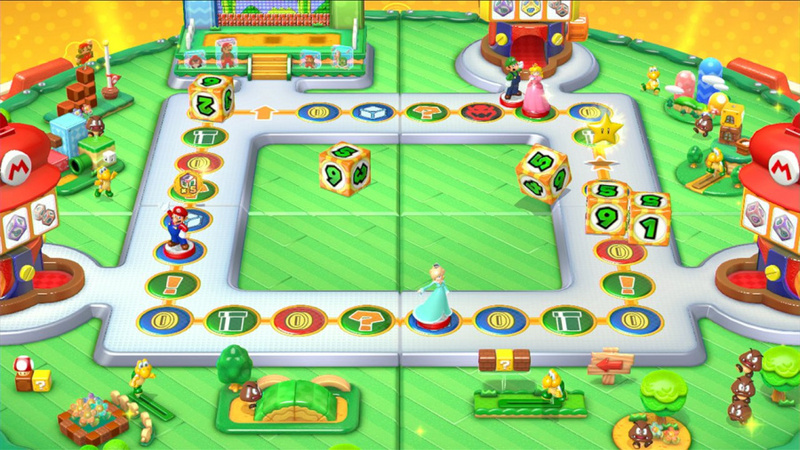 Can you describe some of the minigames in Mario Party 10 which make good use of the Wii U's GamePad, and therefore which wouldn't have been possible in previous instalments of the series? Nishiya-san: When playing the same Bowser minigame, the game play is completely different between those playing on Team Mario and whoever is playing as Bowser using the GamePad. We hope players will want to take turns and experience playing as Bowser for themselves. Do you consider amiibo to be a vital part of Mario Party 10, due to areas such as amiibo Party Mode not being playable without the figures, or is it simply a fun extra in addition to the standard main game? Horita-san: In my opinion, the Bowser Party and Mario Party modes alone give Mario Party 10 an appeal that surpasses that of any of the previous installments. However, amiibo Party mode is by no means merely a fun extra. It's an important part of this game that further enhances its appeal. 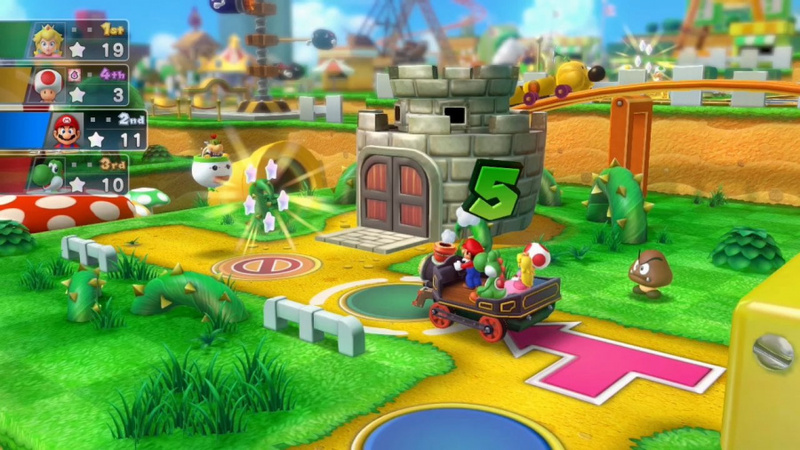 This mode not only features a new kind of gameplay, but also a unique toy-world aesthetic that will enable you to experience Mario Party like never before. The Bowser-based games are clearly a centrepiece in this entry - how did this idea of Bowser being the star of the game, and also being controlled in unique ways with the GamePad, come together? Nishiya-san: When we considered a minigame pitting Bowser and Mario against each other, we imagined a scene where Bowser and Mario would be standing face-to-face ready for battle. On the TV screen you'd see the enormous Bowser looking at the player, while on the GamePad you'd see Mario charging at him. We worked from this basic format to develop our ideas for the Bowser minigames. We then asked ourselves how Bowser would attack Mario. We came up with fire breathing, tilting the terrain, throwing spiked balls, smashing down with hammers, you name it! It wasn't too difficult figuring out how to translate these into actual controls when we considered using them while holding the GamePad. I often hear or read doubts about the fairness of the dice roll, that it might be controlled somehow by the game. I assure you that the outcome of the roll is 100% pure luck. 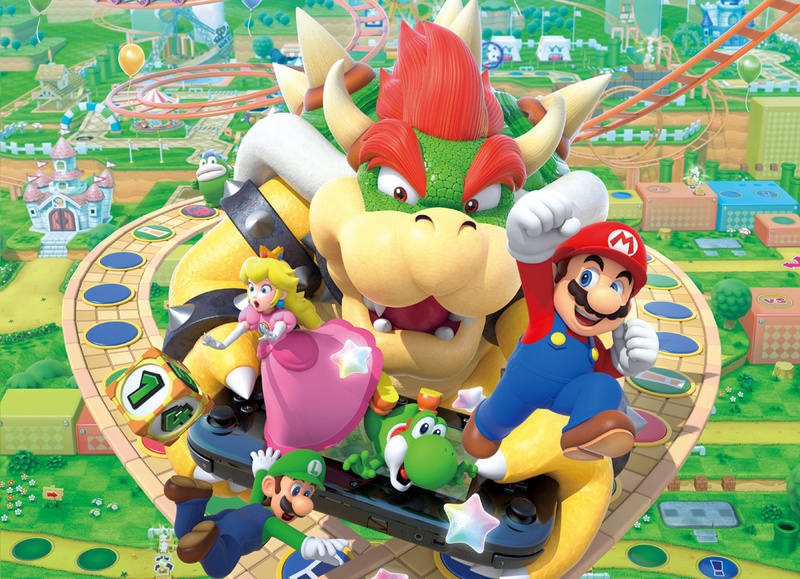 What difficulties, if any, did the development team experience when trying to ensure the gameplay remains fair and balanced when playing a Bowser Party board? Did the 4 vs 1 setup create any challenges you wouldn't usually have encountered when developing a Mario Party game? Nishiya-san: Ensuring the gameplay was balanced was indeed the toughest challenge during development. 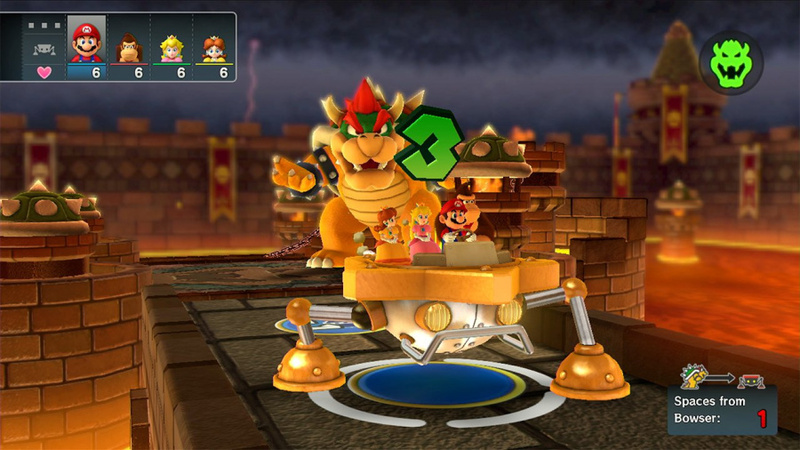 The game is based first of all on the outcome of rolling dice, so depending on your luck, the game could end very quickly, or Bowser might never be able to catch up. We encountered a number of possible issues we had to resolve in order to balance fairness with fun. Through our test plays, we came up with various ways to help those lagging behind. For example, players who are out of the game can provide items to their team mates, Bowser Jr. can offer dice to Bowser when he's falling behind, and so forth. Thanks to these additions, the outcome of the game is up for grabs right until the very end. Of course, even with all our careful adjustments, if you end up rolling nothing but "1" you still won't have a chance of winning. Horita-san: I just want to add an extra point here. I often hear or read doubts about the fairness of the dice roll, that it might be controlled somehow by the game. I assure you that the outcome of the roll is 100% pure luck. That said, even when you're down on your luck, you can still take advantage of the minigames to survive Bowser's onslaught and stay in the running. There are plenty of ways to turn the situation around so I encourage you not to give up until the very end! Could you tell us more about the pacing of a typical game in Mario Party 10 - for example, why do you travel around in a car together and what other features have you implemented to help keep the flow of gameplay at a good pace? Nishiya-san: In past installments, everyone would move separately through the board. As a result, the actions of the other players often didn't affect you. You could just look at the TV screen when it was your turn and during the minigames. 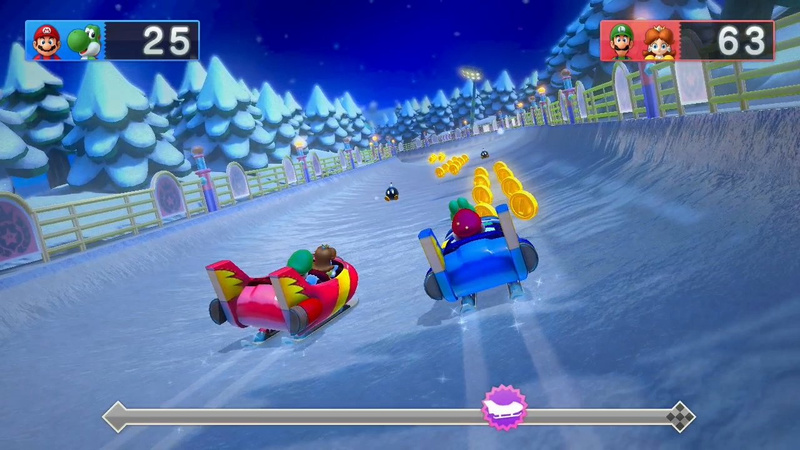 In Mario Party 10 though, players move together in a car, so each player's action will affect the others meaning you'll need to keep an eye on the TV screen. This way, everyone's constantly involved, and we keep the flow of the game at a good pace. Horita-san: We also got rid of a lot of the explanatory texts in order to improve the flow. For example, before a minigame starts, instead of a long text, you now just watch a short movie to understand the rules. When playing on the boards, you can tell what's going on simply by looking at the reaction of the characters without the need for any text to spell it out for you. As a result, the messages are kept to the minimum, and I think you'll find the game flows quite smoothly. In Mario Party, we strive to provide players with a gaming experience in a surreal world, with characters who really show off their individuality, and filled with actions that are overflowing with energy. Can you outline the process for creating a minigame - how are the concepts brought together? Nishiya-san: We gather ideas for the minigames from all the staff members. Some of these suggestions are just a single line or sometimes even just a drawing. The planners in charge of the minigames then get together to expand on or merge different ideas to come up with a minigame. I'm actually one of these planners. In my case, I'm constantly looking out for things in my daily life that could translate into a good mini-game. You can find plenty of interesting ideas if you look for them. Have previous ideas from games such as Nintendo Land, Wii Party U and Game & Wario informed development of Mario Party 10, or provided sources of inspiration? Nishiya-san: We do look for inspirations in previous games. However, not so much from the three games you mention. We often refer to action games featuring Mario like "New Super Mario Bros. U" or "Super Mario 3D World". When we see a character, new or old, acting or reacting in an interesting way, we take note and consider whether or not we could use it in Mario Party as well. 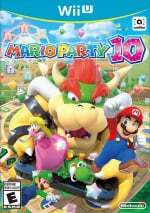 How would you differentiate Mario Party 10 from these other collections (Nintendo Land, Wii Party U and Game & Wario) of minigames and multiplayer experiences? Nishiya-san: We pay particular attention to differentiating Mario Party from games featuring Mii characters. Mii characters represent the players so they generally stick to fairly realistic expressions that don't go too overboard. However, in Mario Party, we strive to provide players with a gaming experience in a surreal world, with characters who really show off their individuality, and filled with actions that are overflowing with energy. In your opinion, what's the most appealing thing about Mario Party 10 for newcomers to the series? Nishiya-san: The multiplayer is most definitely fun. I hope newcomers will play not only with their friends but also with their family too. I also hope they try out the new Bowser experience, using the GamePad to try and defeat Mario and co.
Horita-san: Mario Party 10 features amiibo Party mode, which uses the rules from Mario Party 8 and before; Mario Party mode, which uses the Mario Party 9 rules; and the new Bowser Party mode. You could say that the latest installment is the most definitive Mario Party yet. I think fans of past titles as well as newcomers will find plenty to enjoy here. I'd like to share a small tip for all of you discovering Mario Party 10. In Toad's Room, you will find a Photo Studio. There, you can take photos of Mario and his friends in a variety of settings. When you select the characters to photograph, touch your amiibo figure to the GamePad and… well, you can discover what happens in Mario Party 10! We'd like to thank Nishiya-san and Horita-san for their time, and Nintendo UK for arranging this interview. it seems that is not possible to play the game without being stuck in this stupid car...oh well. My kids love MP10, but I still like the Monopoly level in MP8 the best. @Inkling Of course! One of the reasons I love that my Wii U is backwards compatible. Many of the MP8 levels were fantastic. Would love a VC version or DLC to MP10. And yes I know the car mechanic IS discussed in the interview, I just want to know WHY they decided to keep such a generally hated thing. Ugh, I wish Mario Party would go back to being individual movement again. When it was still fun. @Yosher When you say "weren't many fans" and "generally" you probably draw from personal experience, and that doesn't necessarily speak for the rest of us. Your question needs to be changed to "WHY did you decide to keep the car mechanism" (deleting the hated part) for neutrality, and hey, that exact question has been asked like you noticed. >Why do you travel around in a car together? @HADAA I honestly haven't seen many people say they enjoyed the car mechanic. Everyone I know in person, and 90% of the people I know online -and- from what I've seen posted around on message boards and whatnot, I see people constantly complaining about the car mechanic, and just a select few people actually saying that they DID like the car mechanic. It's such a minority group that I truly wonder why they decided to bring this awful mechanic back. If you can prove me wrong though, and you can show me that it IS popular, then please go right ahead. I'm just going by what I've seen people saying about this game (and Mario Party 9) and barely any of it was positive, but I'd be happy to admit I'm wrong. And I think I need to ask a better question too, then. Like, ''Why did you choose the car mechanic again, instead of trying to think of other ways to keep everyone involved while they wait for their turn?'' Something like that. Just.. something that will tell them that the car mechanic is not something players are waiting for. Honestly, in my opinion, the only good things about this game are a few of the minigames and the Photo Studio. The rest is complete bogus and dull. amiibo Party is a throwback to how the series used to be but the boards there are so... ugh. I had (some) hope for this game, but the reviews seem to indicate it's another mediochre Mario Party. I haven't loved a game in this series since MP3 on the N64. The car mechanic never really appealed to me. That's also why I skipped Mario Party 9. I have Mario Party Island Tour, but I really don't like it. The minigames are dull, the boards are boring, and it feels more like Wii Party Board Game Island than Mario Party. I have also played MPDS and MP8, both of which I love, especially MP8. I still play that one very often. The boards are amazing, the minigames are clever, I just love it! Yeah, MP 1 still rules man. that car thing man... seriously? i,m out. It's nice to hear from the developers after a few Mario Party games from them. They provide a reasonable excuse for keeping the car mechanic, although I don't hate it anyway. amiibo party does feel like a classic Mario Party experience anyway and I don't care about the board size because you can constantly change the 4 individual corners of the board during play. Nd Cube could have just as easily decided to not implement this mode and gone with some other sort of amiibo functionality instead. I might be a bit biased though because I have 7 compatible amiibos out of the possible 9. Overall MP10 has been an enjoyable experience for me and I've only ever played it with no more than 2 human players. To be honest, I can't wait to play it with more than 2 players! I'd like to thank Nd Cube for this game rather than complain about it. MP:Island Tour was ok for me, some of the boards are enjoyable. The mini star collecting one and the Bowser board are good concepts, other than that, the game is bad. Got it as a free game anyway in that free game promotion last year. I like how they gave their reasoning for the car gameplay instead of simply backing away from the question for fear of bad publicity. I've played a few hours of MP10 now - all three modes - and I'm realizing that it's not the car I have a problem with, it's the decreased focus and frequency of minigames. Not having a minigame after each full turn is a big mistake / disappointment imo, as they are the entire reason why my friends and I play the series! Putting a stronger emphasis on dice rolls and landing on specific board spaces just isn't as fun. Amiibo party is good fun but I wish it was a bit more fleshed out. Hopefully in the next game they have at least a couple regular MP 1-8 style boards available for normal play. @SteveSnowmn Maybe there will be some DLC for MP10, I like the game but want more boards. I mean, why wait until the next installment? I'm sorry to anyone who judges this game based on reviews. Reviewers have never been able to properly review party games. The Bowser mode is the most fun I've had playing Mario Party since MP2 and you don't want to miss it. It only works as well as it does because joint movement car mechanic. I am a fan of moving separately too but when they use the car mechanic so perfectly as they do in Bowser Party, I would not want this game to be any different. Very well put together addition to the series in my opinion. I don't care if I am an adult, I'm kind of addicted to the amiibo mode with my wife and another friend that has some. Nishiya-san: In past installments, everyone would move separately through the board. As a result, the actions of the other players often didn't affect you. This doesn't seem to hold too much truth. In the old Mario Party, you can interact with others with items, special spaces, and board events. Even though you have to wait for your turn, you still have to strategize and pay attention to others when it's their turn. I'll admit though, it did take a while for someone's turn to end. Reading the rest of this interview, I can see more as to why people don't like this game (car mechanic aside). This game seems to have been super simplified for the audience, which in turn has lessened the amount of mechanics there are to this game. In a way, because it's more simplified, it can be easier to have fun, but because this game lacks depth in control or any real reason to play other than it's fun with friends, I don't see people becoming invested in this game for a long time. I would type more, but I don't want to keep on ranting for a long time. I hope what I wrote makes sense to any who reads this. I understand the car mechanic just fine but I find that the boards end too quickly for me and my friends. We liked setting the turns to 50 and playing the same board for hours to amass huge cache's of stars and coins. I do like that amiibo party sticks to the same rules, it's just too bad that it's a boring square board instead of the multi-pathed strategic boards of Mario Party past. I'd literally have NO complaints if they had just made a 'Classic' mode and a 'Modern' mode, with pre-MP9 rules on the former and MP9 rules on the latter. That way everyone is happy. @Shirma_Akayaku I think you make a good point, and it makes me wonder if the level of complexity that many people want contradicts what ND is actually trying to achieve here. The MP8 and earlier crowd (so far 7 has been my most enjoyable experience) also really seemed to thrive from the independence and the distinct adventure experience each path on the same board provided, and I can't help but think that it's this mechanic that binds those same people to the enjoyment of a slightly more complex game. Basically, those that enjoy the independence are also the same folks that enjoy the complexity. But... The direction this most recent installment has taken the game has clearly shown that they're not actually trying to make this much of a omni-generational series (I mean that in the purest sense of the "word")... It's really more bi-generational then anything, and I believe it achieves that aim spectacularly: grandparents and their grandchildren will truly delight in this playful wandering. Wiimotes need to die in a fire! Sometimes I think we dig for things to complain about..
Haven't tried amiibo party yet because my friends and I are all a bit reluctant to erase our smash bros. data on the few Mario characters we do have, but the other two modes are great. I honestly prefer the old way of moving around the board separately and I hope they revisit it in the future but I won't let that ruin my experience with what is a game made by people who I believe truly care about the game they're making. When it really comes down to it for me, what would make or break a good Mario party game is whether or not the mini-games are fun. They totally are fun by the way. And although everyone moving around the board together isn't my favorite thing, I do love that it allows us to fight bosses together. "In my opinion, the Bowser Party and Mario Party modes alone give Mario Party 10 an appeal that surpasses that of any of the previous installments." lol? Right I have to write in defense of the car. While I agree it shouldn't be in every board because ones like the monopoly board wouldn't work with it, I do think that it does help streamline the game. The biggest issue I think people have is the lack of strategy generally in the boards. And I agree it could be better. However think of who they are really targeting here. It's families with kids. I can play this game with them for like 25 minutes for some fun. And even my 4 year old and can play. @Ichiban if you tried the game you'll know that some of the mini games require motion controls, which the pro controller is not capable of. I understand why the car exists, but it really ruined the series for me. Now that I have heard it is basically here to stay it looks like no more future buys here. On the other hand though, I am pretty happy that they tried something new with Bowser Party. That mode sounds like a lot of fun and the one place the car actually works. @DBPirate I understand the car mechanic too. There's a lot of Mario Party things that have come and gone that I liked and didn't like. Mario Party 8 looked like there were good ideas but the execution (4:3, 30 FPS, no improvement over GCN) fell. Mario Party 5 introduced the capsules which I didn't like much. Mario Party 6 & 7 had the mic minigames which weren't that fun. 7 had 8-player minigames but that was a hassle to pull off sharing controllers. Oh well, I'm sure if I get 10 I'll find some enjoyment out of it with amiibos and the Gamepad being the gimmick this time. If not, here's to Mario Party 11 on the NX. So there is a good reason for this change in Formula with the Mario Party Franchise after all. Personally I don’t mind the change in Formula with the fact that it’s better than going round a board in circles several times, and I quite like the addition of Familiar Mario Bosses and Enemies as Boss Battles, not to mention a more reasonable way to be in the lead.